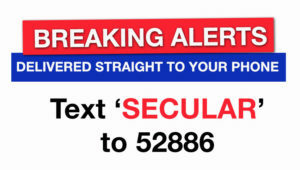 Washington, D.C.– The Secular Coalition for Texas, a chapter of the Secular Coalition for America, will host the first ever Secular Caucus at the Texas Democratic Party Convention on Friday, June 17 in San Antonio. The caucus will educate the Texas Democratic party about nonreligious voters, who now comprise more than one-quarter of the entire Democratic party. The Secular Caucus will take place the day before the Permanent Resolutions Committee will vote on new additions to the state party platform. Among those under consideration are three resolutions submitted by the Secular Coalition for Texas that were adopted at local conventions. They include: a resolution to repeal religious exemptions to child protection laws; a resolution to strike discriminatory language from the state Constitution that bars nontheists from holding elected office; and a resolution supporting secular reproductive health care policies. If approved at the state level, the resolutions could be considered at the national Democratic convention in Philadelphia. The Secular Caucus will be held from 10:30 am to 11:30 am at Club Level (4), South Club, in the Hospitality Room. The event is open to attendees of the convention and credentialed members of the press.